He's faster than a speeding bullet, more powerful than a locomotive and can leap marathons in a single stride. His name is Super Rich! He may be 51 years old but that doesn't stop the oldest man from Club Ed running away with the LA Marathon title. It was a great day for many other Club Ed runners list below and especially Jeff Bryant and Will Longyear who both set new personal records in the "monsoonathan". The marathon morning started out looking very ominous with a 100% chance of rain forecasted. However, the running gods spared the racers until about 5 miles into the race and the downpour began. 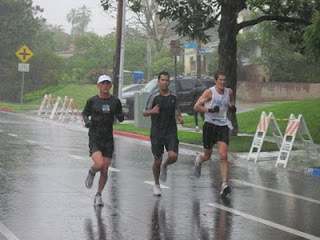 Along with the rain came a nice tailwind that pushed the runners for about 18 miles of the race. It was a strong enough tailwind that the lead runner was on 2:04 World Record pace through about 20 miles. The runners who were capable of powering through the quad pain induced by rain soaked running shoes and the rolling hills passed many people fading in the last 10K. The end of the race also had its fare share of drama trying to relocate runners at the finish who were trying to sty warm. Massage tables were crowded with runners trying to stay warm under blankets while hotel lobbies and busses housed the overflow of runners trying to prevent hypothermia. Rich on the other hand decided that Bloomingdales (handbags) was the warmest place in Santa Monica. Ask Rich and he can fill you in on the rest of the story. Here are the Club Ed results below and we will update USATF as soon as they become available. See more race photos from the race thanks to Debbie Richardson who came out to support.